Tear bread into pieces and place on baking sheet. Toast bread until deep golden brown, 10 minutes. Transfer to a food processor and coarsely grind into bread crumbs. While bread toasts pound out chicken breasts to 1/4-inch thick. Season the chicken with salt and pepper. Coat chicken with flour, reserve. Beat egg with splash of water in shallow dish. 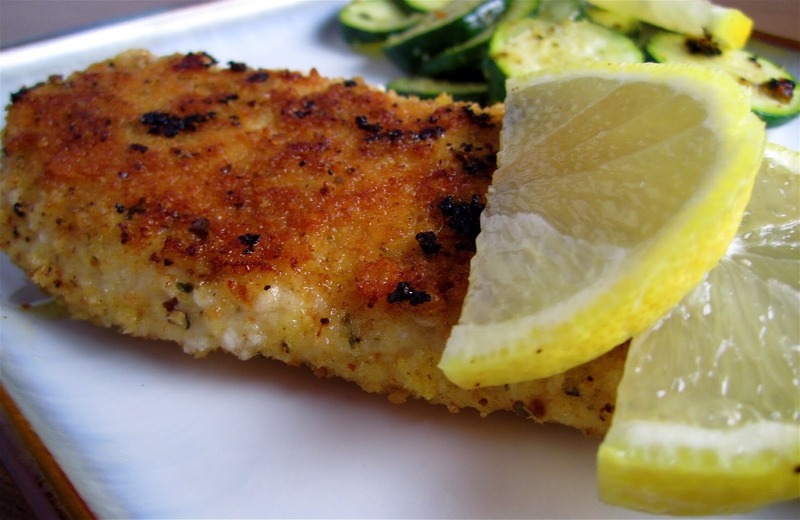 Transfer bread crumbs to a plate and season with herbs and poultry seasoning. Heat a thin layer of olive oil in a large skillet over medium-high heat. Coat chicken in egg then bread crumbs and add to pan. Saute until golden and firm, 3 to 4 minutes on each side.